The Premium soft-closing hinge that we recommend from IBMH has an excellent quality. First of all, it has the base with easy adjustment in 3 dimensions, that is, depth, height and laterality. This aspect is very important when aligning all the doors of the built furniture, because the doors are always misaligned and the furniture maker must make the necessary adjustments so that they are aligned, which is not usually achieved, with the easy 3D adjustments this is an extremely simple and fast task, as only one screw should be rotated for each dimension to be adjusted. When we talk about hinges, it is common to find furniture hardware manufacturers in China that tend to send jigsaw hinges that misalign the doors and which then need to be corrected by the furniture manufacturer, achieving, on few occasions, a perfect finish. However, at IBMH we have the sophisticated 3D soft-closing hinges, that is, depth, height and laterality, making the adjustment very accurately. Only the respective screw should be rotated to each dimension, as necessary. Carpentry experts love the easy handling of these hinges, because thanks to the smoothness of the adjustment it can be done by one person, without needing another one to hold the door while it is adjusted. 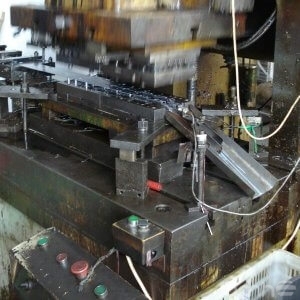 Another important advantage of 3D soft-closing hinges is that they have “double way”. This means that they move to both sides, avoiding a common wear on the regular hinges, given by the rebound effect and lever of the hinges of a single move. This wear is due to the force done to the door when it is fully opened and you press on the lateral fixing screws of the cabinet, so consequently these screws usually deteriorate. 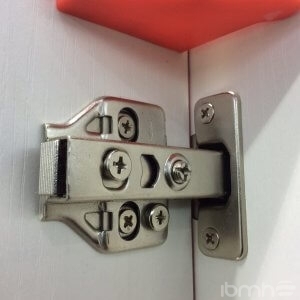 It is important to bear this in mind because many times furniture hardware are imported from China and they look very similar to the 3D hinges we recommend at IBMH, but they are not “double way” and once such wear has occurred, it is necessary to change the complete furniture. In addition, the 3D hinge we recommend has the base with a wide contact surface, in which a swing movement is not possible. This, added to the fact that the depth of the bowl is always 13mm exactly, and that it has the “double way” system, makes the life of the 3D hinge very high, and in general far superior to other qualities. We can say that our recommendation is one of the best hinges that can be imported from hardware manufacturers in China, and can perfectly compete with famous European brands.